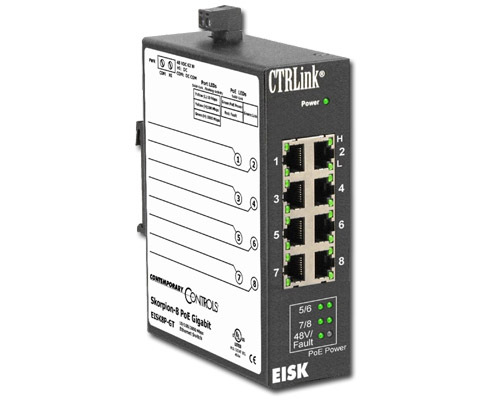 The EISK8P-GT gigabit switch within the Skorpion Series is an 8-port unmanaged Ethernet switch with Gigabit Ethernet (GigE) performance on all ports and PoE on four ports–supplying 15.4 W per PoE port. GigE jumbo frames up to 9216 bytes are supported for maximum system performance. 10/100 Mbps legacy devices are supported via Auto-Negotiation—accommodating any Ethernet automation system. This low-cost compact unit has a rugged metal enclosure and is intended for DIN-rail mounting in control panels. The unit is powered from 48 VDC and operates over 0 to 60°C temperature range. Ports 5 – 8 PoE provide data and power over one Cat5e cable. The unit acts as power sourcing equipment (PSE) – supplying up to 15.4 W per port for IEEE 802.3af-compliant powered devices (PD). PoE eliminates the need for additional power supplies for Ethernet-enabled devices placed in challenging locations — such as wireless access points or IP cameras mounted out of reach or outdoors. PDs can be located up to 100 metres from the switch. This plug-and-play switch requires no configuration. All ports automatically configure data rate and duplex using the Auto-negotiation protocol. Depending on the capability of the link partner, communication is set at 10, 100 or 1000 Mbps at either half- or full-duplex. All ports accommodate either crossover or straight-through cable via the Auto-MDIX protocol. The unit is powered from 48 VDC. LED indicators assist in troubleshooting network issues.